We are so excited to announce our new comfort menu at iGrin Children’s Dentistry. Our mission is to give every child that walks in the perfect patient experience so that it sets the tone for the rest of their lives. We want them to be so comfortable that they actually enjoy the dentist! That is why we came up with this fun way to allow them to pick different items that would enhance their experience. The menu is FREE for each and every patient. Items on the menu include a plethora of items which are distracting for the child while they are getting treatment done. We offer headphones so that our iGrin kids can watch Disney movies right in the dental chair. We offer fidget spinners so they can fiddle with toy and have something to do with their hands. Also, on the comfort menu, we offer fun blankets that are shaped like mermaids and alligators. These are very popular for pictures! Parents love to take pictures and post on our social media pages like Facebook and Instagram. We also offer sweet stuffed animals on our comfort menu like the Lion pictured below. Each child can pick their favorite stuffed animal before sitting in the chair. Lastly, we offer chapstick because often times, children will tell us that their lips feel chapped after a procedure. We like to offer this item as an option on our comfort menu in case they feel like their lips are extra dry. 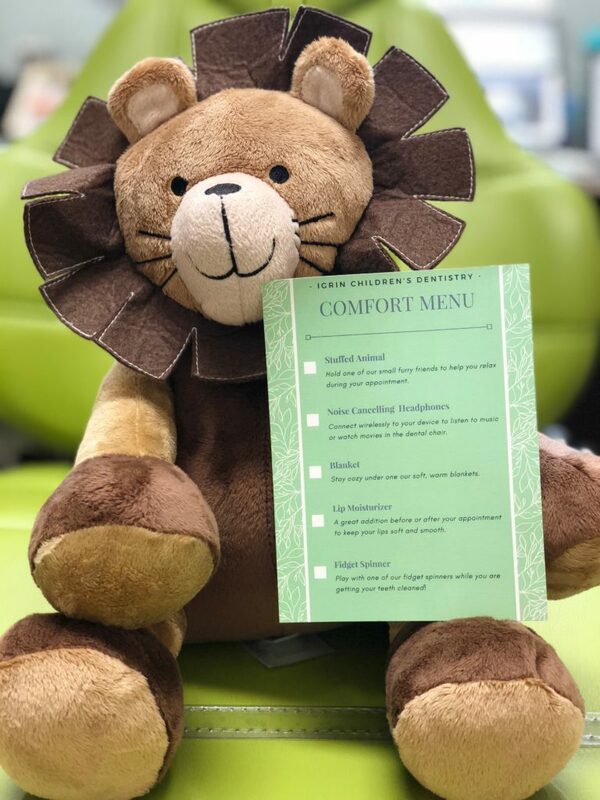 Even though we did not include everything on comfort menu pictured, we want our patients to know that they can ask for ANYTHING that would make them more comfortable– bottled water, juice, crackers, cookies, coffee (found on in our cafe, free for every patient). Please don’t hesitate to call us with any questions you may have and we look forward to serving you and your child.